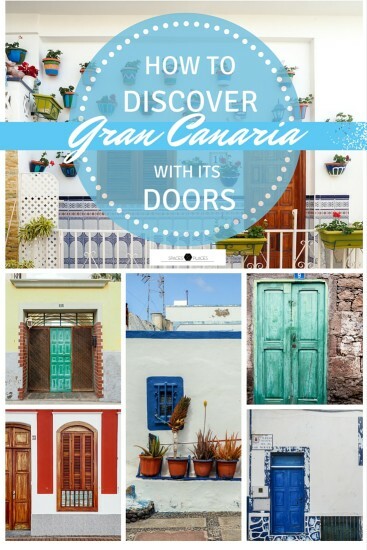 Back in London and looking at all those doors and windows I brought back with me through dozens of pictures and trying to figure out what attracted me so much when I stumbled upon them in Gran Canaria. For all of us every travel starts and ends in front of a door. It’s our home door that we lock and leave behind us with enthusiasm, desire of wanderlust and living new adventures knowing that other doors are waiting to be opened at our destination. And these are doors of any kind of shape and colour. Each one hiding an interior way too many times I would have loved to contemplate. (Promise that one day I’ll be brave enough to ring that door bell and ask if I may see the interior behind that beautiful door). And well I can say the same about windows. I can’t help myself from taking a peek at the interior every time I see a window with no curtains. Found these venturing into the maze of streets just behind Las Canteras beach. The urban configuration of this area is like a grid so it can be really easy to get lost and if you don’t want to use Maps all the time just look at the old doors and windows and will know if you’ve walked there before. Less than 30 minutes by car from Las Palmas, Arucas is a small but picturesque village worthy for a stop and go. This is heaven instead!! Agaete is a really nice and small town in the northern-west part of Gran Canaria but it’s a must to have a walk around the port area: Puerto de la Nieves. Moving towards the south of the island I suggest a stop in Agüimes, another small town in which every single door, window and facade is Instagrammable. Every tiny house looks in a different way, with different colours, features and decorations. Mogán is a really touristy and Mediterranean kind of seaside village. Lovely houses, bars and restaurants along the coastline and the cutest cottages ever climbing up the hillside. So I came back from this trip with a new obsession as you have seen. A new goal is to collect old doors and windows all over the world. I can only imagine what kind of door-paradise Morocco, Turkey or Greece can be! If you have been in any of these places or in another door-paradise let me know what you’ve found.